This challenge is for nonprofit folks who touch communications in some way – be it full-time, part-time, REALLY part-time or volunteer-time. We want to see your world. It can be from your personal account or from your organization�s account. It doesn’t matter, just snap away. We’ll start snapping on January 1, and play through January 31. 1. Share the image below on your Instagram feed if you haven’t already. Get your colleagues playing – feel free to share it on FB to your Page and on Pinterest or Twitter, too! More the merrier!! 4. Make SURE to tag every challenge image #NPCommPix We’ll be reposting our favorites throughout the month. Where do I post? We recommend Instagram and Twitter, but you can play anywhere. If you spend a lot of time on Pinterest or Flickr or your own blog, post there too. You can also post to the Nonprofit Marketing Guide Facebook page if you want: fb.com/nonprofitmarketingguide. 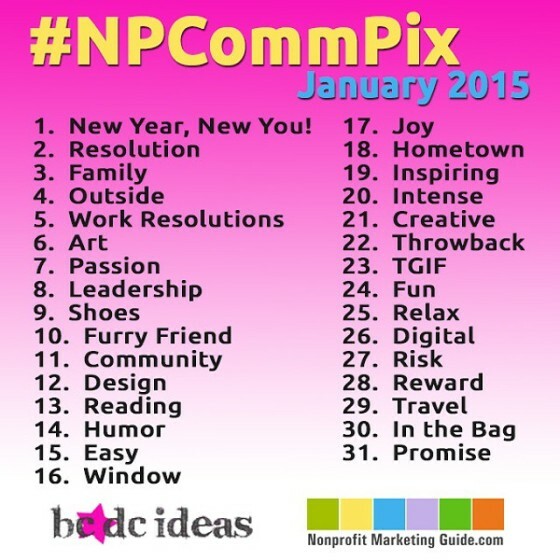 Just be sure to use the hashtag #npcommpix wherever you post.